Despite playing well in 1978’s first three majors, Jack Nicklaus repeatedly came up just short. He ended that at the Old Course with his third British Open triumph. At age 38, some of the usual suspects were wondering if time was running out on Jack Nicklaus’ remarkable career. He answered them at St. Andrews. He opened with rounds of 71 and 71, despite putting performances that lacked his expected luster. He rallied with birdies on 14 and 15 on Saturday to shoot a 69 and enter the final round one stroke behind the leaders, Tom Watson and England’s Peter Oosterhuis. Sunday’s final round evolved into a duel between Nicklaus and his playing companion, New Zealand’s Simon Owen. The pair came to the 16th with oOwen up by a stroke. But Nicklaus’ birdie to Owen’s bogey brought them to the famous road hole with Jack holding a one-stroke lead. Nicklaus made a par. Owen made another bogey. 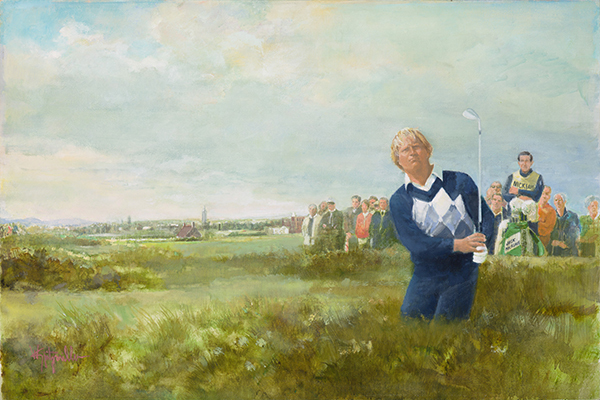 A par on 18 and Nicklaus, resplendent in an Argyle sweater and long blonde locks, once again lofted the old claret jug as the “champion golfer of the year” to give us what is considered an iconic image.